Rules governing the way free nursery school education in England is delivered are to be changed, making it easier for parents to take up places. Under plans announced by the Deputy Prime Minister Nick Clegg, parents will be able to spread their free nursery place over two days rather than three. Mr Clegg will also announce 10 pilot areas where disadvantaged two-year-olds will get a free place from September. Councils and nurseries say the plans require proper funding. Currently, about 800,000 three- and four-year-olds in England take up 15 hours of free education a week. Mr Clegg says that from September, the hours during which parents can drop their children with early years education providers for their free place will be extended by two hours. At present, parents are restricted by having to drop their children off no earlier than 0800 and picking them up no later than 1800 – these hours will be extended to 0700-1900. Under the current rules, the free 15-hour nursery entitlement can only be used over a minimum of three days, meaning parents can only leave their children for five hours a day. Mr Clegg says this is not flexible enough for parents who work part time, and that parents will be able to use the 15 hours over two days. There will also be revised statutory guidance making it clear that parents do not have to pay to use their child’s free early years place, following concerns that some free places were being made conditional on parents being able to make additional payments. Plans to give 15 hours of free pre-school education a week to some 260,000 two-year-olds from poorer homes, first announced under Labour, will be extended nationwide from September 2013. But Mr Clegg is announcing 10 pilot areas for this scheme from September 2012, benefiting 1,000 children in 10 neighbourhoods. Under the scheme, the 20% most deprived children in those areas will be eligible. The trial neighbourhoods are in Blackpool, Cornwall, Greenwich, Kent (Ashford), Lancashire (Preston), Lambeth, Newcastle, Northamptonshire (Wellingborough), Peterborough and Rotherham. Mr Clegg said: “We’re revolutionising the early start our children get in life – there will be more free childcare, it will be higher quality, and it will be more flexible for parents. The Local Government Association (LGA) welcomed the announcement, but said the expansion of early years education must be met with proper capital funding. David Simmonds, chairman of LGA’s children and young people board, said: ” It’s achievable as it currently stands. 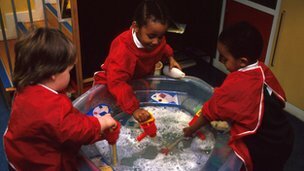 The chief executive National Day Nurseries Association, Purnima Tanuku, said: “The funding allocated to early years provision must cover costs, otherwise it is not sustainable for many nurseries to participate in the free entitlement, without pushing up the price of paid-for care for other parents. The shadow minister for children and families, Sharon Hodgson, said the government should develop a comprehensive plan for childcare. “While children’s centres are closing or having their budgets squeezed, ministers must be clear about how they are going to ensure that there are enough well-qualified staff and accommodation in order to provide good quality care for an extra 260,000 children. The Daycare Trust welcomed the changes, saying increased flexibility over the number of days and hours benefited the whole family.